The Amalfi Coast—where picturesque villages dotted with lemon trees overhang the Gulf of Salerno—is a slice of heaven on earth. 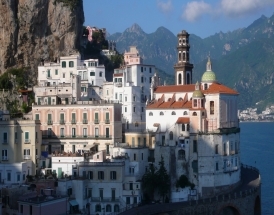 The Amalfi Coast is the perfect destination for a romantic getaway or a family vacation. Amalfi, Ravello, and Vietri showcase cultural and artisanal treasures; Positano boasts an internationally acclaimed art scene; and the quaint coastal village of Minori is in the ideal location for exploring the coast (and is home to our Torre Paradiso! ).